Carol more than stands alone as a unique work of art. The only thing the film has in common with Brokeback is both films are about two people of the same gender who happen to fall in love, in a time when such love was forbidden. I will not refer to Carol as a lesbian love story. It’s no more a lesbian love story than Brokeback was a “gay cowboy movie,” as it was drubbed 10 years ago. 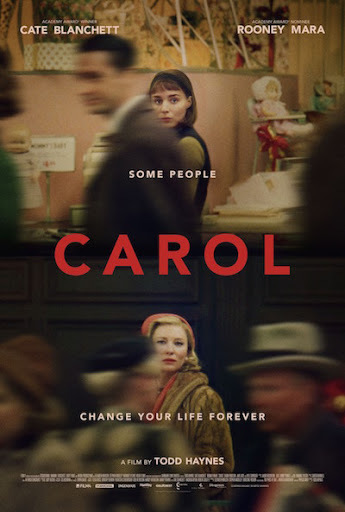 Carol is so much more, and it’s success starts with the masterful direction by Todd Haynes. He directed 2002’s underrated Far from Heaven, which dealt with similar themes: a 1950s housewife with a seemingly perfect marriage is actually married to a closeted homosexual. As their marriage deteriorated, she found herself drawn to her black gardener. The film was only nominated for four Academy Awards (despite being one of year’s best films), and it retains an 87% approval rating on Rotten Tomatoes. Haynes’ adaptation of the Highsmith novel, from a flawless script by Phyllis Nagy (a marked improvement over her only other credit, the 2005 HBO film Mrs. Harris) is the recipient of six Oscar nominations, and a career-best of 93% on Rotten Tomatoes. No one was more skeptical of the film than I. First, I did not approve of Haynes’ last effort: an overlong, pretentious remake of Mildred Pierce, made for HBO in 2011 and starring Kate Winslet. Sure, it was nice to look at – but it was a daunting undertaking to try to reimagine the iconic 1945 potboiler, with Joan Crawford in an Oscar-winning performance. Some critics agreed with me (Robert Bianco of USA Today, to name one), but the masses applauded, and it was an awards staple. Adding to my hesitation was my disdain of Blanchett’s Oscar-winning role in 2013’s Blue Jasmine, a shrill, unlikable (and unoriginal, which really floored me) take on A Streetcar Named Desire’s Blanche DuBois. Hell, it even had Alec Baldwin (he played Stanley Kowalski on Broadway and in a 1995 television adaptation with Jessica Lange). Blanchett was once again being called an early favorite for a Best Actress Oscar for Carol, and after I deemed at least five other lead actresses more deserving in 2013, I was shaking my head. Well, Blanchett won’t likely win her third Oscar for Carol, because (as of this writing) the [deserving] frontrunner is Room’s Brie Larson, but had Blanchett not won two years ago for Jasmine, I think this year’s Best Actress race would be playing out differently. Cate the Great is smashing here. It’s a fiercely nuanced and focused performance, maybe the best of her career (no small accomplishment – Elizabeth, Notes on a Scandal, I’m Not There in her filmography). Matching Blanchett scene-for-scene is the perfectly cast Rooney Mara, curiously nominated in supporting category of the Oscars (this is often called “category fraud,” much like the leads of Brokeback were separated). Mara is no stranger to massive challenges in her career: she was cast as Lisbeth Salander in the 2011 American version of The Girl with the Dragon Tattoo, less than two years after the acclaimed Swedish version hit U.S. theatres. Mara succeeded and won an Oscar nomination. She has lived up to that promise, and then some, with a poignant, heartbreaking turn as Therese, the shopgirl and fledgling photographer who catches Carol’s (Blanchett) eye during the busy Christmas shopping season. Much has been reported on the first interaction between Carol and Therese in a New York City department store. The scene is as good as all that, with so much power in what is not said. Credit the cinematography by Edward Lachman, Haynes’ collaborator, for delivering a breathtaking sequence that sets the stage for how the film’s remaining story unfolds. Carol is in the midst of a divorce with her husband Harge (Kyle Chandler, creating a complicated and multi-dimensional man in a role that could have been one-note). He knows of Carol’s proclivities. Her best friend is Abby (the invaluable and chameleonic Sarah Paulson, currently delivering a riveting on FX’s American Crime Story: The People V. O.J. Simpson), with whom Carol had a brief affair, years ago. Paulson is never-better in her brief, assured work as a no-nonsense confidant to Carol. Abby is as “out” as any woman could be in the 1950s, and her face-to-face confrontation with Harge is a stunner. As with Heaven, the behaviors and feelings of Carol and Therese don’t require the screenplay to define words like “homosexual” or “lesbian.” Haynes captures this brilliantly, with his eye always tending to details and subtle gestures. Without the crisp color and obvious time capsule of the players in Carol, a viewer could watch this film and truly believe it was filmed in the 1950s. Haynes does not miss a beat. I argued with some of the film’s promos billing it as a thriller, but there are elements of a thriller here. Carol and Therese flee New Jersey and NYC area, when Harge correctly concludes what’s happening between Carol and Therese. Faced with the threat of losing custody of her beloved young daughter, Rindy, the two women embark on a cross-country road trip. It is less an escape from reality than a trip toward a hopeful future and life together. What transpires is as intellectually intense to any thriller released in 2015. Haynes captures the mood of the time, before the term career woman became most women, but he does not dwell on sexual politics. His exquisite sense of direction and eye for details focuses on the suspense of the younger woman, Therese, coming to terms with her attraction to the enigmatic, more experienced older woman. Age is truly a number, and their age difference is mentioned but not given a major presence. By drawing out these two spectacular lead performances, Haynes delivers a film dedicated to loneliness, love, and repressed desire, still six decades later. It may seem astonishing it took decades to bring this story to cinemas. But take comfort that it happened as it should, in the careful, talented hands of Haynes, Blanchett, and Mara.